“Inspire” public art sculpture by Sean Hennessey and John Henderson for Baltimore’s Lots Alive Outdoor Community Art Program. The Baltimore Office of Promotion & The Arts and the Baltimore Office of Sustainability’s Baltimore Green Network outdoor community art program, “Lots Alive” sought the creation of temporary outdoor artworks sited on vacant lots along Baltimore’s Park Heights Ave. 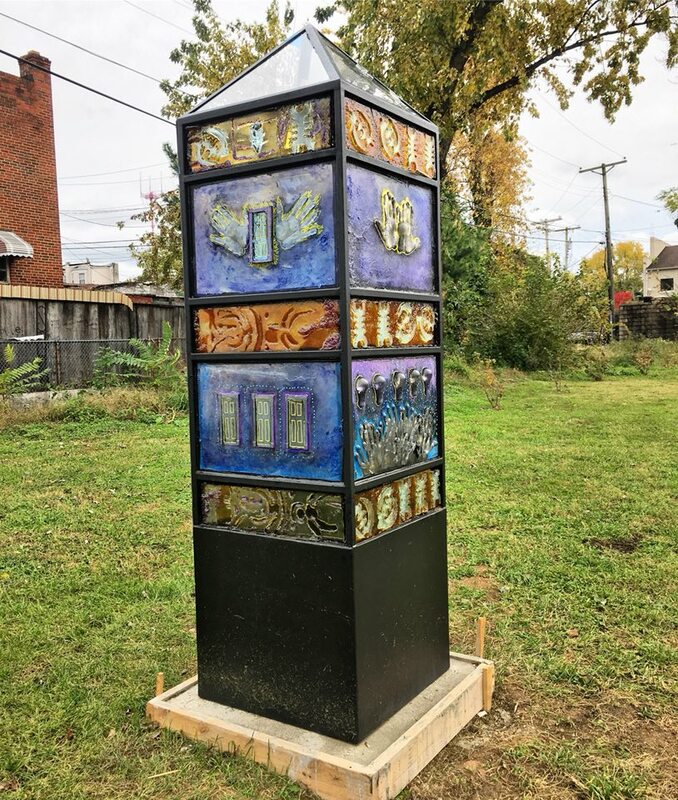 Designed in partnership with Mayor Catherine E. Pugh’s Baltimore Green Network, the “Lots Alive” project aims to breathe life into underutilized vacant spaces through creative interventions. Six artists were selected and Sean Hennessey and John Henderson collaborated (as H&H Collective) on a cast glass and steel sculpture titled ‘Inspire’. Artist Sean Hennessey installs the sculpture “Inspire” on site. The work created is an internally illuminated, four-sided obelisk with panels mounted into the framework. 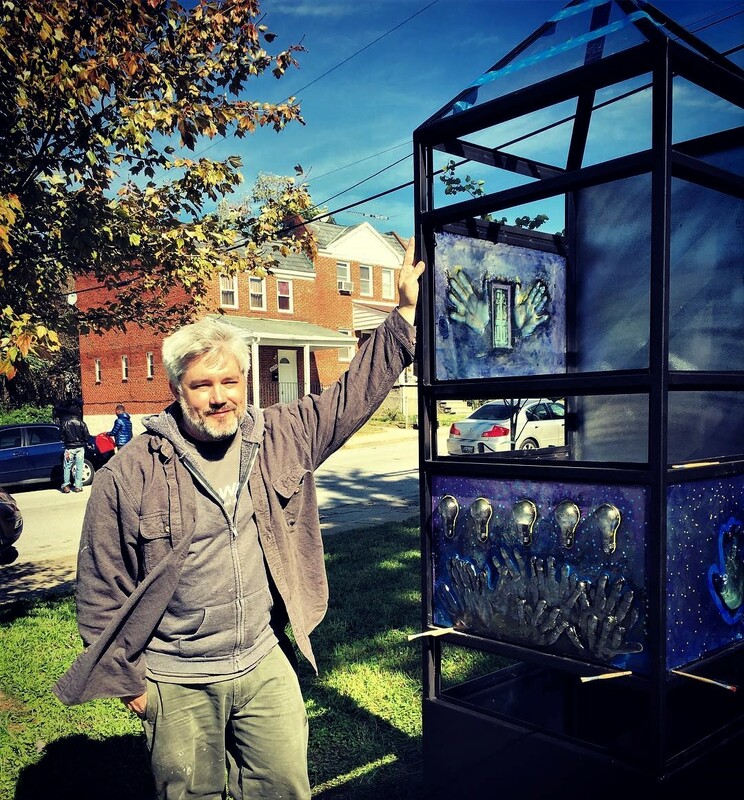 Using cast glass, Sean and John have created a strong sculpture for Baltimore. John created dimensional imagery using Adinkra symbols. For Sean – the work is a bit of a farewell love letter to Baltimore as he moves to Seattle. This is one of the only pieces Sean had shown in Baltimore City since his first solo show in 2006. His narrative concept for the artwork story was to have the bottom panels on the sculpture represent a wanting or dream, with the upper panels represent fulfillment. Detail of cast glass inset panel in H&H Collective sculpture “Inspire”. The sculpture has solar powered LED lighting to make the artwork command attention at night. 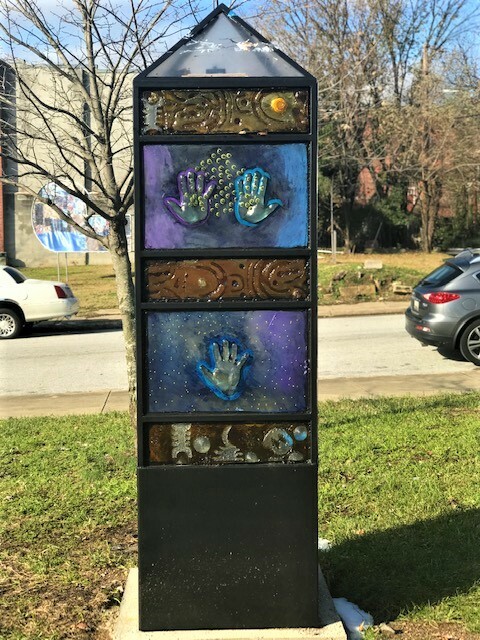 The artwork is located at 4215 Park Heights Avenue, Baltimore, MD. View of sculpture “Inspire” located at 4215 Park Heights Ave, Baltimore, MD. This entry was posted in glass and steel sculpture, john henderson, Public Art, sean hennessey by admin. Bookmark the permalink.